New York City Mayor Michael Bloomberg today unveiled the first of what will be a fleet of 50 Chevrolet Volt NYPD police cruisers, which will hit the treacherous and busy streets of Manhattan this year. “This is the latest and largest-ever addition of electric vehicles to the City’s fleet, which is already the largest municipal clean-air vehicle fleet in the nation,” Bloomberg said in a statement. “We will continue to lead by example, but we also must provide New Yorkers with tools to make environmentally friendly choices in their own lives. 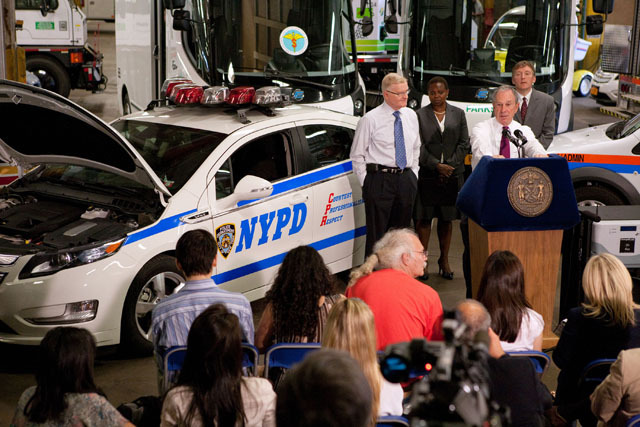 The Volt is the first fully-electric car to join the NYPD’s ranks. In addition, the New York City Police Department will add 10 Ford Transit Connect electric vehicles and 10 Navi-Star trucks to its fleet.